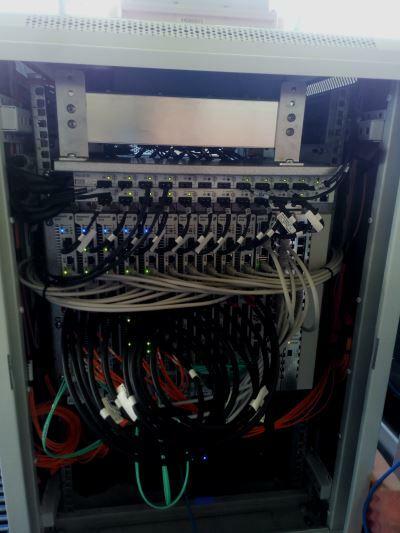 It ain't pretty but it works: The 200kg 5G test device employed at Telstra's 5G Innovation Centre. Right now, the future of mobile connectivity puts the notorious ‘brick’ phones of the 1980s to shame: It weighs 200 kilograms and needs a ute to cart it around. But although the vehicle-mounted 5G ‘mobile phone’ used for testing at Telstra’s newly launched 5G Innovation Centre on the Gold Coast may seem a million miles from today’s iPhones and Samsung handsets, it is helping to usher in a new era for wireless communication. Telstra is preparing for what communications minister Senator Mitch Fifield has previously described as an “inflection point” for Australia’s economy: The rollout of 5G. The new wireless mobile standard doesn’t just promise blazing speeds for end users; its capacity, low jitter and ultra-low-latency make possible a host of new applications running over cellular networks. One of the drones used during the demonstration. Telstra used the new centre’s launch to demonstrate a range of potential uses for 5G. For example, flying a swarm of HD-video-transmitting drones in combination with AI-based image recognition to help stage a surf rescue. 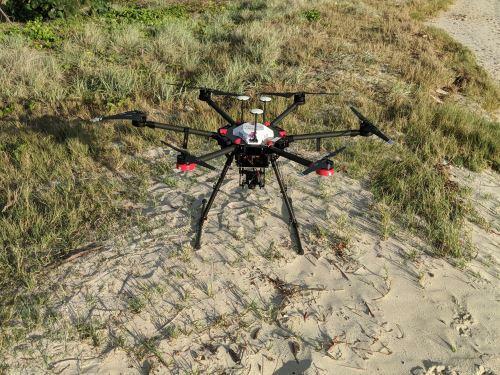 Although similar applications can run over the existing 4G networks (indeed, the drone demo relied on Telstra’s existing LTE network), it’s very much a case of “possible with 4G but practical with 5G,” Telstra CTO Håkan Eriksson said. A drone swarm could easily chew through much of the capacity of a 4G cell, but with 5G Telstra expects such applications to become commonplace. And although its 200kg prototype device won’t exactly slip into a pocket, Telstra is predicting rapid miniaturisation of 5G technology ahead of the 2019 rollout of the first wave of services based on the new standard. “One of the reasons for creating this type of innovation centre is that we can then take real-life use cases and make sure we have devices available for customers for those use cases,” the COO said. “You’ve seen the size of the handset today but very, very quickly that will shrink into a tiny bit of silicon that will find its way into handsets and gateways,” said the telco’s head of networks Mike Wright. But beyond that, 5G-capable chipsets will rapidly find their way into more “things” ranging from water meters to agriculture sensors and devices embedded in vehicles, Wright said. Telstra staged a live 5G demonstration that achieved 3.1 gigabit per second download speeds and in excess of 300 megabits upstream – with 6ms latency. Telstra’s ute-mounted device was used for live streaming of 360-degree video. Other installations at the new centre include a display to highlight the beam-forming capabilities of 5G, which will allow capacity to be directed to areas of high network traffic, and a robotic arm used to demonstrate the impact of the lower latency of 5G compared to 4G. 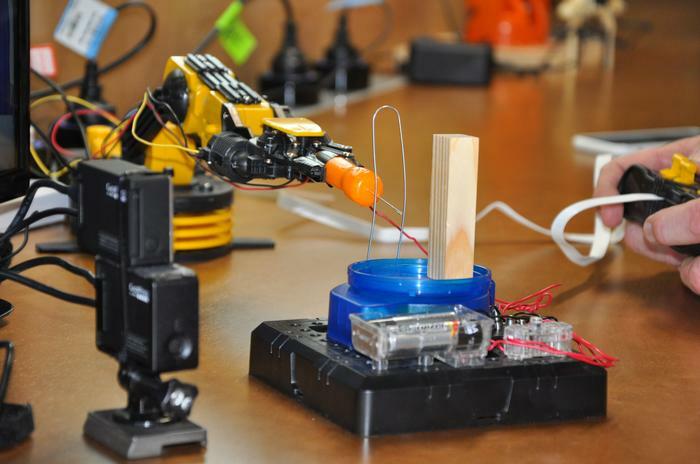 At 20ms – typical latency for a 4G network – it is a struggle to control the robotic arm in a precise manner over a video feed. When latency drops below 10ms, the impact can be dramatic, opening the possibility of remote driving or other forms of remote control that require an operator to respond quickly to changing conditions, Seneviratne said. “This year is about learning about 5G and that’s going to inform our early launches,” Wright said. He said typically the rollout for a new generation of technology such as 5G could be expected to begin in areas where the previous generation had seen the highest demand. Telstra is still studying the propagation of 26Ghz (mmWave) signals in city environments. Telstra and Ericsson last year announced that they successfully conducted a call over spectrum in the 26GHz band. In addition to mmWave, 5G services will be based on the 3.6GHz band. Although Telstra is yet to pick up 3.6GHz spectrum, it will be able to leverage its 3.4GHz spectrum, Seneviratne said. The Australian Communications and Media Authority (ACMA) is reallocating spectrum in the 3.6GHz band for use in 5G services. Standards organisation 3GPP last year endorsed dubbed Non-Standalone 5G NR (New Radio). The standard involves combining 4G and 5G, Wright said. Standalone 5G NR will be signed off by 3GPP this year and Wright expects the first deployments of that configuration, which relies on a 5G core, will eventually take place in environments such as campuses and mining sites – “specific areas with massive demand”. The author travelled to the Gold Coast as a guest of Telstra.